English Heritage is a charity, independent of government, and guardian to some of the UK’s most treasured and iconic buildings and monuments. The 400 historic properties in the care of English Heritage include such important and well-loved places as Kenwood House, Stonehenge, Tintagel Castle, Osborne House, Hadrian’s Wall and Dover Castle. 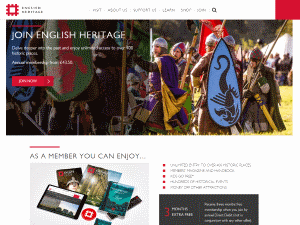 Why not join English Heritage?